Annoying right? What’s more important? To get noticed in browse and leverage Pinterest? Both of which will make the most of traffic that hasn’t hit your shop yet. Or to have horizontal images that make your listing pages a bit more pleasing for the customers who have already made it to your page? I’ve decided that it’s actually better to make the images more favorable to the browsers that haven’t made it to your shop yet. Making the most of the images that GET the traffic to your shop, basically. 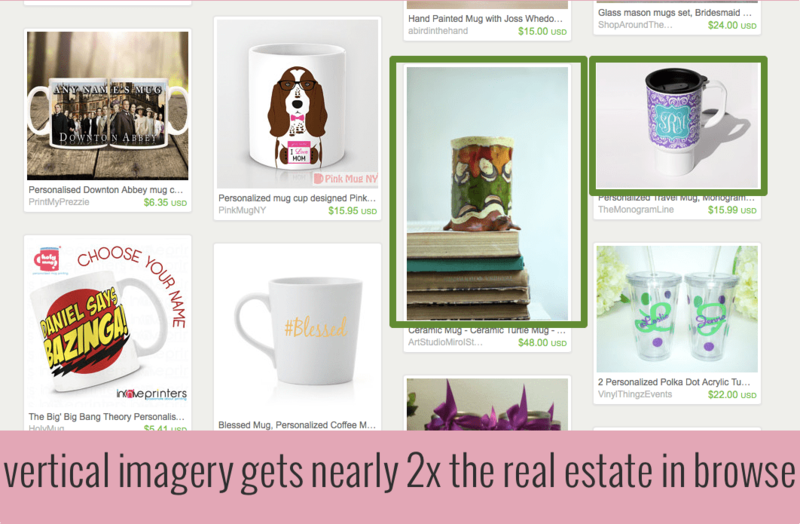 Now, as you know, the image that shows in search and browse, is the image that will be the first in your listing page. 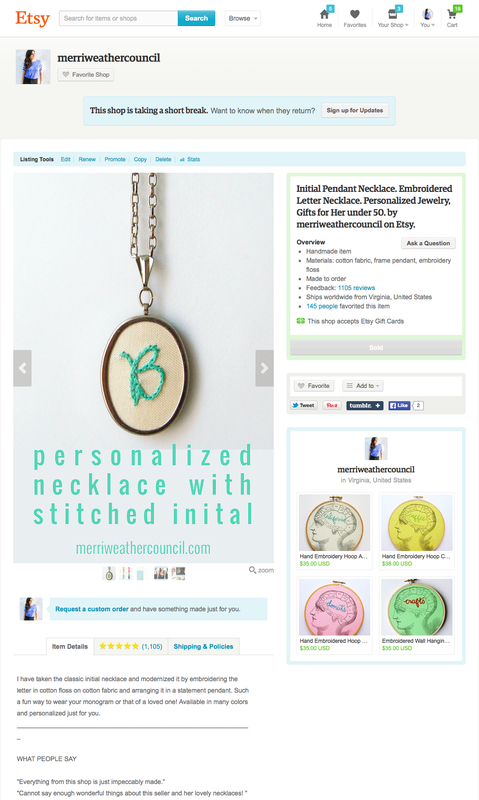 It’s pretty interesting that in most places on Etsy, shoppers will see the thumbnail of your photo, but not on browse! On browse, they see the FULL image! This was just a trial – to see how it goes, how I felt about it, etc – and so i’m just sharing my experience here with you. I took all of my listing images that were horizontal, and turned them into vertical images. Further, I added text to them, which is something that we see a lot on Pinterest – and apparently, adding copy to a vertical image makes a pin more likely to be pinned. It actually isn’t terrible on the listing page, either! Now, I didn’t want the text to show in my main shop page. I wanted my listings to look pretty much as they did in the thumbnail, gallery version and list version view of my shop, so I adjusted the thumbnail in the edit listing mode. Step one: click “adjust thumbnail” after uploading your vertical image. Step two: Drag your image around until it is cropped as you’d like it. In my case, this meant moving the image down so the text was cropped out of the thumbnail. Results: My shop shows “normal” text-less images in list and gallery mode. When I pinned these images myself (which I only really did a few times) I did notice they got more attention than the text-less horizontal images did when I pinned those. Now, like I said, my shop is on vacation at the moment, so I don’t have a lot of data to share numbers wise, but I think for many shops, this might be something worth trying, specifically if your actual item is vertical! Generally I do suggest making all of your images the same size and shape on Etsy (all five within a listing, especially) but this might be worth a try for you if you’re inclined to updating a lot of images and feeling experimental. 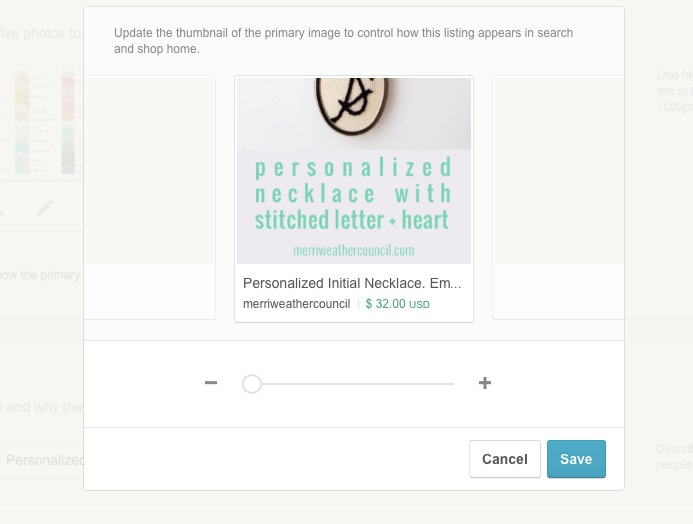 Interested in more Etsy optimization tips? Check out my course for Etsy sellers! Seriously, don’t list one more thing without this info. 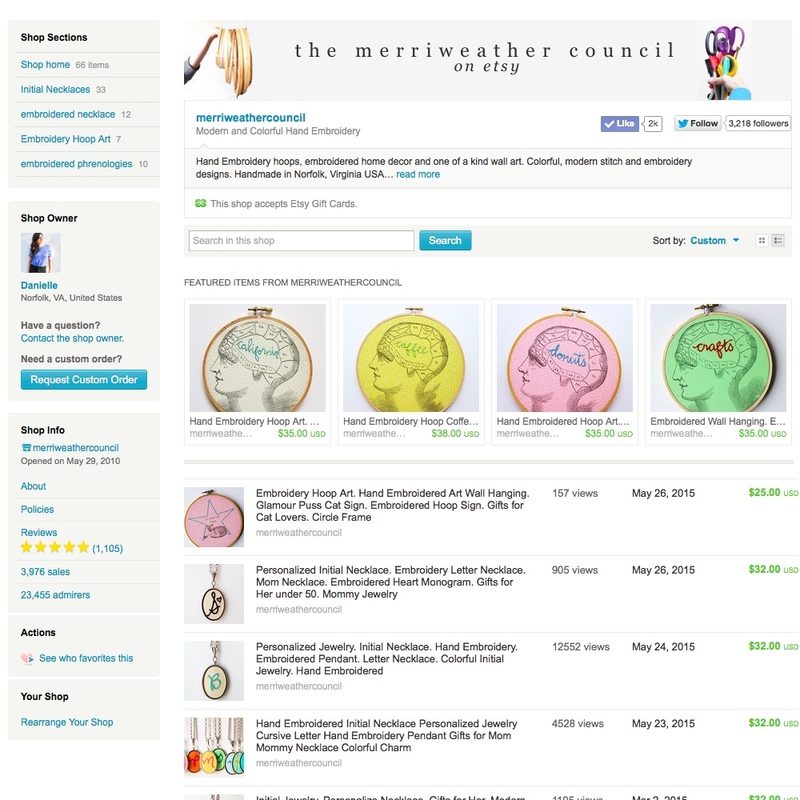 Etsy Relevancy: What is it and Why Does Getting Found in Etsy Search Matter? I actually really like this idea. I haven’t thought about how my photos appear to people in Pinterest and have been making them to look good specifically on etsy . This is a really good tip! I might try it on a few of my listings. I’m glad it was helpful! Pinterest is a HUGE traffic source, so it makes sense to leverage it! This is a really interesting idea. I’m currently working on my product photos and experimenting, so this is a great time for me to see this! Thank you! You’re so welcome! I know it’s a bit of work but if you have items that are just renewing over and over, it’s one image and done! This is SO smart, Danielle! Thanks for sharing! Great information! I had noticed that longer product photos are more eye-catching in the browse sections, but definitely hadn’t taken it as far as you did, Danielle. I’m definitely going to try switching like you did, too! Thanks so much for sharing what you learned from trying it out! Love this. I’ve read in so many places that it’s a terrible idea to have text in your product photos, so I’ve never thought about the possibilities – especially when it comes to Pinterest! Going to try this on a few items, I think. Thank you! it’s not the norm, and I probably wouldn’t do it on my own site, but on etsy I think it’s good. Um, this is fascinating! Up until reading this post, I hadn’t clued in to the fact that one even COULD use vertical images for Etsy listings. That makes sense though because I use PicMonkey to edit a lot of my photos and they have a collage option that is rectangular in format and called ‘pinter-etsy’ so I wondered. I think with the more visual platforms like Pinterest and IG that text really helps people to quickly understand the photo and to recognize why they need that product. I’m definitely going to experiment with this, will let you know how it goes! This post is AWESOME. 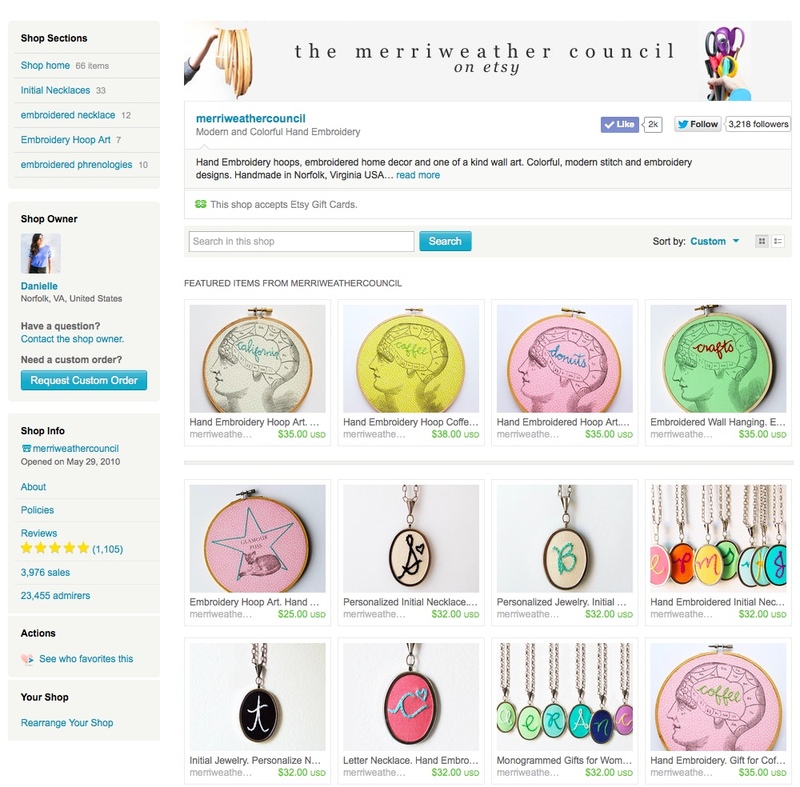 Thank you so much for taking the time to write such a comprehensive recap of what you found works best for Pinterest/Etsy! Now I just have to find time to re-do each listing in my shop ;) Thanks again! I’ve been trying to add text to the pictures and have noticed the increased views/clicks/pins. I’ll definitely add the vertical ones to see what happens! Thanks! along the way they come in a number of siblings. Great idea! I was wondering what exact pixel dimensions you used for your vertical images because I’ve tried to do this before but ended up with ugly gray bars on the sides of my images in etsy. Danielle, you are a genius! I’m about to update all of my photos, and that horizontal/vertical question has been weighing heavily on my mind. Adding text is genius. Thanks for the helpful tip! I am going to be starting a new product business soon. I was going to go straight to Shopify instead of Etsy. Is there a benefit of starting with both? How many boards should I have/create to pin my etsy items to? Is it better to have a few rather than lump them all in one? Thanks! So how is your experiment going? Have you seen better traffic with the new photos?